Ice XI is the hydrogen-ordered form of Ih, the ordinary form of ice. Different phases of ice, from ice II to ice XVI, have been created in the laboratory at different temperatures and pressures. The total internal energy of ice XI is about one sixth lower than ice Ih, so in principle it should naturally form when ice Ih is cooled to below 72 K. The low temperature required to achieve this transition is correlated with the relatively low energy difference between the two structures. 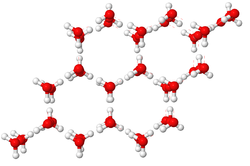 Water molecules in ice Ih are surrounded by four semi-randomly directed hydrogen bonds. Such arrangements should change to the more ordered arrangement of hydrogen bonds found in ice XI at low temperatures, so long as localized proton hopping is sufficiently enabled; a process that becomes easier with increasing pressure. Correspondingly, ice XI is believed to have a triple point with hexagonal ice and gaseous water at (~72 K, ~0 Pa). Ice XI has an orthorhombic structure with space group Cmc21 containing eight molecules per unit cell. Its lattice parameters are a=4.465(3) Å, b=7.859(4) Å, and c=7.292(2) Å at 5 K. There are actually 16 crystallographically inequivalent hydrogen-ordered configurations of ice with an orthorhombic structure of eight atoms per unit cell, but electronic structure calculations show Cmc21 to be the most stable. Another possible configuration, with space group Pna21 is also of interest, as it is an antiferroelectric crystal, which Davidson and Morokuma incorrectly suggested as the most stable structure in 1984. In practice, ice XI is most easily prepared from a dilute (10 mM) KOH solution kept just below 72 K for about a week (for D2O a temperature just below 76 K will suffice). The hydroxide ions create defects in the hexagonal ice, allowing protons to jump more freely between the oxygen atoms (and so this structure of ice XI breaks the 'ice rules'). More specifically, each hydroxide ion creates a Bjerrum L defect and an ionized vertex. Both the defect and the ion can move throughout the lattice and 'assist' with proton reordering. The positive K+ ion may also play a role because it is found that KOH works better than other alkali hydroxides. The exact details of these ordering mechanisms are still poorly understood and under question because experimentally the mobility of the hydroxide and K+ ions appear to be very low around 72 K. The current belief is that KOH acts only to assist with the hydrogen reordering and is not required for the lower-energy stability of ice XI. However, calculations by Toshiaki Iitaka in 2010 call this into question. Iitaka argues that the KOH ions compensate for the large net electric dipole moment of the crystal lattice along the c-axis. The aforementioned electronic structure calculations are done assuming an infinite lattice and ignore the effects of macroscopic electric fields created by surface charges. Because such fields are present in any finite size crystal, in non-doped ice XI, domains of alternating dipole moment should form as in conventional ferroelectrics. It has also been suggested that the ice Ih => ice XI transition is enabled by the tunneling of protons. Although ice XI is thought to be a more stable conformation than ice Ih, the transformation is very slow. According to one report, in Antarctic conditions it is estimated to take at least 100,000 years to form without the assistance of catalysts. Ice XI was sought and found in Antarctic ice that was about 100 years old in 1998. A further study in 2004 was not able to reproduce this finding, however, after studying Antarctic ice which was around 3000 years old. The 1998 Antarctic study also claimed that the transformation temperature (ice XI => ice Ih) is −36 °C (237 K), which is far higher than the temperature of the expected triple point mentioned above (72 K, ~0 Pa). Ice XI was also found in experiments using pure water at very low temperature (~10 K) and low pressure – conditions thought to be present in the upper atmosphere. Recently, small domains of ice XI were found to form in pure water; its phase transition back to ice Ih occurred at 72 K while under hydrostatic pressure conditions of up to 70 MPa. Ice Ih that has been transformed to ice XI and then back to ice Ih, on raising the temperature, retains some hydrogen-ordered domains and more easily transforms back to ice XI again. A neutron powder diffraction study found that small hydrogen-ordered domains can exist up to 111 K.
There are distinct differences in the Raman spectra between ices Ih and XI, with ice XI showing much stronger peaks in the translational (~230 cm−1), librational (~630 cm−1) and in-phase asymmetric stretch (~3200 cm−1) regions. Hints of hydrogen-ordering in ice had been observed as early as 1964, when Dengel et al. attributed a peak in thermo-stimulated depolarization (TSD) current to the existence of a proton-ordered ferroelectric phase. However, they could not conclusively prove that a phase transition had taken place, and Onsager pointed out that the peak could also arise from the movement of defects and lattice imperfections. Onsager suggested that experimentalists look for a dramatic change in heat capacity by performing a careful calorimetric experiment. A phase transition to Ice XI was first identified experimentally in 1972 by Shuji Kawada and others. Ice XI is ferroelectric, meaning that it has an intrinsic polarization. To qualify as a ferroelectric it must also exhibit polarization switching under an electric field, which has not been conclusively demonstrated but which is implicitly assumed to be possible. Cubic ice also has a ferrolectric phase and in this case the ferroelectric properties of the ice have been experimentally demonstrated on monolayer thin films. In a similar experiment, ferroelectric layers of hexagonal ice were grown on a platinum (111) surface. The material had a polarization that had a decay length of 30 monolayers suggesting that thin layers of Ice XI can be grown on substrates at low temperature without the use of dopants. One-dimensional nano-confined ferroelectric ice XI was created in 2010. As was mentioned, ice XI can theoretically form at low pressures at temperatures between 50–70 K – temperatures present in astrophysical environments of the outer solar system and within permanently shaded polar craters on the Moon and Mercury. Ice XI forms most easily around 70 K – paradoxically, it takes longer to form at lower temperatures. Extrapolating from experimental measurements, it is estimated to take ~50 years to form at 70 K and ~300 million years at 50 K. It is theorized to be present in places like the upper atmospheres of Uranus and Neptune and on Pluto and Charon. Small domains of ice XI could exist in the atmospheres of Jupiter and Saturn as well. The fact that small domains of ice XI can exist at temperatures up to 111 K has some scientists speculating that it may be fairly common in interstellar space, with small 'nucleation seeds' spreading through space and converting regular ice, much like the fabled ice-nine mentioned in Vonnegut's Cat's Cradle. The possible roles of ice XI in interstellar space and planet formation have been the subject of several research papers. Until observational confirmation of ice XI in outer space is made, the presence of ice XI in space remains controversial owing to the aforementioned criticism raised by Iitaka. The infrared absorption spectra of ice XI was studied in 2009 in preparation for searches for ice XI in space. Also, Pluto's outermost moon, Hydra, was recently discovered to have ice XI on the surface by New Horizons space probe during its July 14, 2015 flyby of the Pluto system. ^ Fan, Xiaofeng; Bing, Dan; Zhang, Jingyun; Shen, Zexiang; Kuo, Jer-Lai (1 October 2010). "Predicting the hydrogen bond ordered structures of ice Ih, II, III, VI and ice VII: DFT methods with localized based set" (PDF). Computational Materials Science. 49 (4): S170–S175. doi:10.1016/j.commatsci.2010.04.004. ^ Castro Neto, A.; Pujol, P.; Fradkin, E. (2006). "Ice: A strongly correlated proton system". Physical Review B. 74 (2): 024302. arXiv:cond-mat/0511092. Bibcode:2006PhRvB..74b4302C. doi:10.1103/PhysRevB.74.024302. ^ Line, Christina M. B.; Whitworth, R. W. (1 January 1996). "A high resolution neutron powder diffraction study of D2O ice XI". The Journal of Chemical Physics. 104 (24): 10008–10013. Bibcode:1996JChPh.10410008L. doi:10.1063/1.471745. ^ Leadbetter, A. J.; Ward, R. C.; Clark, J. W.; Tucker, P. A.; Matsuo, T.; Suga, S. (1985). "The equilibrium low-structure of ice". J. Chem. Phys. 82: 424–428. Bibcode:1985JChPh..82..424L. doi:10.1063/1.448763. ^ Kuo, J. L.; Singer, S. J. (2003). "Graph invariants for periodic systems: Towards predicting physical properties from the hydrogen bond topology of ice". Phys. Rev. E. 67: 016114. Bibcode:2003PhRvE..67a6114K. doi:10.1103/physreve.67.016114. ^ Hirsch, T. K.; Ojamae, L. (2004). "Quantum-Chemical and Force-Field Investigations of Ice Ih: Computation of Proton-Ordered Structures and Prediction of Their Lattice Energies". J. Phys. Chem. B. 108: 15856. doi:10.1021/jp048434u. ^ Davidson, E. R.; Morokuma, K. J. (1984). "A proposed antiferroelectric structure for proton ordered ice Ih". Chem. Phys. 81: 3741. Bibcode:1984JChPh..81.3741D. doi:10.1063/1.448101. ^ Kawada, Syuji (1989). "Dielectric properties of KOH-doped D2O ice". Journal of the Physical Society of Japan. 58 (1): 295. Bibcode:1989JPSJ...58..295K. doi:10.1143/JPSJ.58.295. Retrieved 12 May 2014. ^ Fukazawa, Hiroshi; Ikeda, Susumu; Mae, Shinji (1998). "Incoherent inelastic neutron scattering measurements on ice XI; the proton-ordered phase of ice Ih doped with KOH". Chemical Physics Letters. 282 (2): 215–218. Bibcode:1998CPL...282..215F. doi:10.1016/S0009-2614(97)01266-9. ^ Suga, Hiroshi (1 October 1997). "A facet of recent ice sciences". Thermochimica Acta. 300 (1–2): 117–126. doi:10.1016/S0040-6031(96)03121-8. ^ Chris Knight and Sherwin J. Singer, Theoretical study of a hydroxide ion within the ice-Ih lattice, Physics and Chemistry of Ice (Proceedings of the 11th International Conference on the Physics and Chemistry of Ice), ed., Werner F. Kuhs (Royal Soc. of Chemistry, 2007), p. 339. ^ Chris Knight and Sherwin J. Singer, Tackling the problem of hydrogen bond order and disorder, Physics and Chemistry of Ice (Proceedings of the 11th International Conference on the Physics and Chemistry of Ice), ed., Werner F. Kuhs (Royal Soc. of Chemistry, 2007), p. 329. ^ a b c Iitaka, Toshiaki (13 July 2010). "Stability of ferroelectric ice". arXiv:1007.1792. ^ Castro-Neto, A. H.; Pujol, P; Fradkin, Eduardo (21 Jul 2006). "Ice: A strongly correlated proton system". Physical Review Letters. 74: 024302–12. arXiv:cond-mat/0511092. Bibcode:2006PhRvB..74b4302C. doi:10.1103/PhysRevB.74.024302. ^ Fortes, A. D.; Wood, I. G.; Grigoriev, D.; Alfredsson, M.; Kipfstuhl, S.; Knight, K. S.; Smith, R. I. (1 January 2004). "No evidence for large-scale proton ordering in Antarctic ice from powder neutron diffraction". The Journal of Chemical Physics. 120 (24): 11376–9. Bibcode:2004JChPh.12011376F. doi:10.1063/1.1765099. PMID 15268170. ^ Furić, K.; Volovšek, V. (2010). "Water ice at low temperatures and pressures; new Raman results". J. Mol. Structure. 976: 174–180. Bibcode:2010JMoSt.976..174F. doi:10.1016/j.molstruc.2010.03.024. ^ Yen, Fei; Chi, Zhenhua (16 Apr 2015). 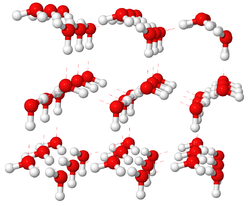 "Proton ordering dynamics of H2O ice". Physical Chemistry Chemical Physics. 17: 12458–12461. arXiv:1503.01830. Bibcode:2015PCCP...1712458Y. doi:10.1039/C5CP01529D. ^ M. Arakawa, H. Kagi and H. Fukazawa, Annealing effects on hydrogen ordering in KOD doped ice observed using neutron diffraction, J. Mol" Structure 2010; 972 111–114. ^ a b c d Arakawa, Masashi; Kagi, Hiroyuki; Fernandez-Baca, Jaime A.; Chakoumakos, Bryan C.; Fukazawa, Hiroshi (17 August 2011). "The existence of memory effect on hydrogen ordering in ice: The effect makes ice attractive". Geophysical Research Letters. 38 (16). Bibcode:2011GeoRL..3816101A. doi:10.1029/2011GL048217. Retrieved 7 April 2012. ^ Abe, K.; Shigenari, T. (2011). "Raman spectra of proton ordered phase XI of ICE I. Translational vibrations below 350 cm-1, J". Chem. Phys. 134: 104506. Bibcode:2011JChPh.134j4506A. doi:10.1063/1.3551620. ^ Raza, Zamaan; Alfè, Dario (28 Nov 2011). "Proton ordering in cubic ice and hexagonal ice; a potential new ice phase--XIc". Physical Chemistry Chemical Physics. 13: 19788–95. Bibcode:2011PCCP...1319788R. doi:10.1039/c1cp22506e. ^ Dengel, O.; Eckener, U.; Plitz,, H.,; Riehl, N. (1 May 1964). "Ferroelectric behavior of ice". Physics Letters. 9 (4): 291–292. Bibcode:1964PhL.....9..291D. doi:10.1016/0031-9163(64)90366-X. ^ Kawada, Shuji (1 May 1972). "Dielectric Dispersion and Phase Transition of KOH Doped Ice". Journal of the Physical Society of Japan. 32 (5): 1442–1442. Bibcode:1972JPSJ...32.1442K. doi:10.1143/JPSJ.32.1442. ^ Tajima, Yoshimitsu; Matsuo, Takasuke; Suga, Hiroshi (1984). "Calorimetric study of phase transition in hexagonal ice doped with alkali hydroxides". Journal of Physics and Chemistry of Solids. 45 (11–12): 1135–1144. Bibcode:1984JPCS...45.1135T. doi:10.1016/0022-3697(84)90008-8. ^ Matsuo, Takasuke; Tajima, Yoshimitsu; Suga, Hiroshi (1986). "Calorimetric study of a phase transition in D2O ice Ih doped with KOD: Ice XI". Journal of Physics and Chemistry of Solids. 47 (2): 165–173. Bibcode:1986JPCS...47..165M. doi:10.1016/0022-3697(86)90126-5. ^ Iedema, M. J.; Dresser, M. J.; Doering, D. L.; Rowland, J. B.; Hess, W. P.; Tsekouras, A. A.; Cowin, J. P. (1 November 1998). "Ferroelectricity in Water Ice". The Journal of Physical Chemistry B. 102 (46): 9203–9214. doi:10.1021/jp982549e. ^ Su, Xingcai; Lianos, L.; Shen, Y.; Somorjai, Gabor. "Surface-Induced Ferroelectric Ice on Pt(111)". Physical Review Letters. 80 (7): 1533–1536. Bibcode:1998PhRvL..80.1533S. doi:10.1103/PhysRevLett.80.1533. ^ Zhao, H.-X. ; Kong, X.-J. ; Li, H.; Jin, Y.-C.; Long, L.-S.; Zeng, X. C.; Huang, R.-B. ; Zheng, L.-S. (14 February 2011). "Transition from one-dimensional water to ferroelectric ice within a supramolecular architecture". Proceedings of the National Academy of Sciences. 108 (9): 3481–3486. Bibcode:2011PNAS..108.3481Z. doi:10.1073/pnas.1010310108. PMC 3048133. PMID 21321232. ^ a b c McKinnon, W. B.; Hofmeister, A.M. (August 2005). "Ice XI on Pluto and Charon?". Bulletin of the American Astronomical Society. Division for Planetary Sciences Meeting , American Astronomical Society. 37 (49.02): 732. Bibcode:2005DPS....37.4902M. ^ Grossman, Lisa (25 August 2011). "Electric ice a shock to the solar system". New Scientist. Retrieved 7 April 2012. ^ Fukazawa, H.; Hoshikawa, A.; Ishii, Y.; Chakoumakos, B. C.; Fernandez-Baca, J. A. (20 November 2006). "Existence of Ferroelectric Ice in the Universe". The Astrophysical Journal. 652 (1): L57–L60. Bibcode:2006ApJ...652L..57F. doi:10.1086/510017. ^ Iedema, M.J.; Dresser, M.J.; Doering, D.L. ; Rowland, J.B.; Hess, W.P. ; Tsekouras, A.A.; Cowin, J.P. "J. Phys. Chem. B '". 102'. 9203: 1998. ^ Arakawa, M.; Kagi, H.; Fukazawa, H. (1 October 2009). "Laboratory Measurements of Infrared Absorption Spectra of Hydrogen-Ordered Ice: a Step to the Exploration of Ice XI in Space". The Astrophysical Journal Supplement Series. 184 (2): 361–365. Bibcode:2009ApJS..184..361A. doi:10.1088/0067-0049/184/2/361. Chaplin, Martin (2007-11-11). "Ice-eleven (ice XI)". Water Structure and Science. Retrieved 2012-04-02. Bramwell, Steven T. (21 January 1999). "Ferroelectric ice". Nature. 397 (6716): 212–213. Bibcode:1999Natur.397..212B. doi:10.1038/16594. This page was last edited on 12 September 2017, at 22:41 (UTC).